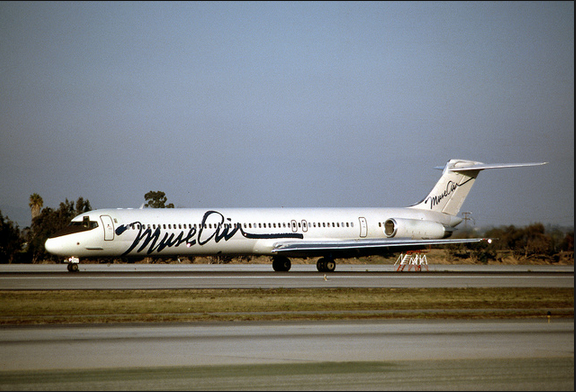 Muse Air, was a domestic U.S. airline operating from 1981 to 1987. At an earlier point its headquarters were on the property of William P. Hobby Airport in Houston, Texas. At a later point its headquarters were in Suite 700 of the Executive Tower in Dallas, Texas. TranStar Airlines Douglas DC-9-51 operating a Houston service at New Orleans in March 1987 with an American Trans Air wide-body L-1011 in the background. Both airlines are notable for never having a fatal accident along with their somewhat "ill-fated," co-operative experiences with Southwest Airlines. The company was first established as a Texas-based commuter called Muse Air, but much like Southwest Airlines, only flying larger mainline equipment. Muse Air's name originates from its founder and the one time president of Southwest Airlines, Marion Lamar Muse. 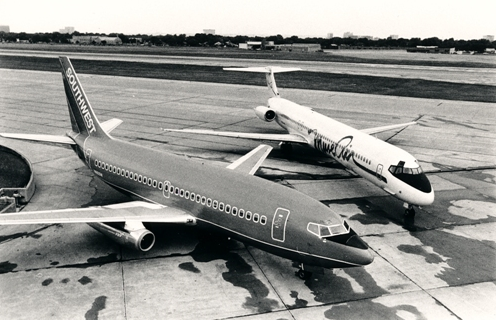 It began service between Dallas and Houston in 1982 with two Douglas DC-9 aircraft. An air traffic controller's strike almost immediately made things difficult for the company, and Muse stepped down as CEO to let his son Michael take over the company. By the end of 1984 the company was still struggling, and actively looking for a merger to keep it afloat. At the end of the year, Harold Simmons, president of the Amalgamated Sugar Company offered the airline the money to continue, on the condition that Michael Muse resign, and that his father return as CEO. Despite the new influx of cash and Lamar Muse in charge again, the company was not able to generate a consistent profit despite its use of non-union labor and competitive fares. Muse Air prohibited smoking on their flights long before the United States implemented Federal restrictions. 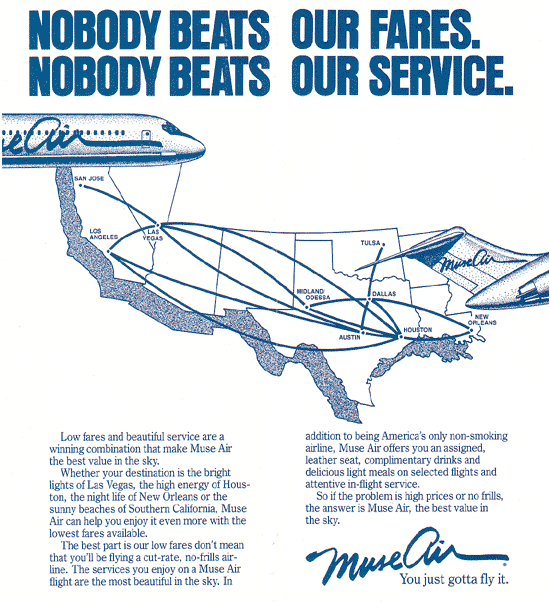 June 25, 1985, Southwest Airlines acquired Muse Air, and MuseAir continued to operate as a separate airline. In February 1986 its name changed to "TranStar." Lamar Muse was removed from having any active role in management, and the company was restructured. With the addition of MD-80 aircraft, its routes changed to scheduled service flights from California through Texas to Florida, and they were restricted from carrying mail, air freight, and any interline passengers traveling partly on other airlines. Among other changes were a new corporate image, replacing Muse Air's beige aircraft livery and color scheme branding, with a dark blue tone, accentuated by concentric multi-hued pinstripes banding the fuselage. Attempts were made to integrate the Transtar pilots with Southwest Airlines pilots, but in a classic example of misapplied BATNA an integrated seniority list was rejected by the Transtar pilot's association. At its peak, TranStar employed some 900 people and served 14 cities, but by mid 1987 the company was still not making a profit, and operations were ceased. In 1986 prior to TranStars demise, a brief feeder service between Killeen and Austin was established and undertaken under the name and guise TranStar Skylink. These services were operated by and in association with Rio Airways. 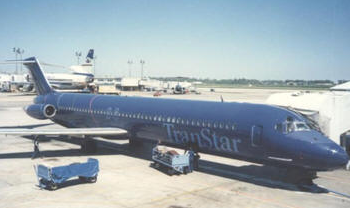 None of Rio Airways planes however were ever painted with TranStar branding as indicated in some print advertising.